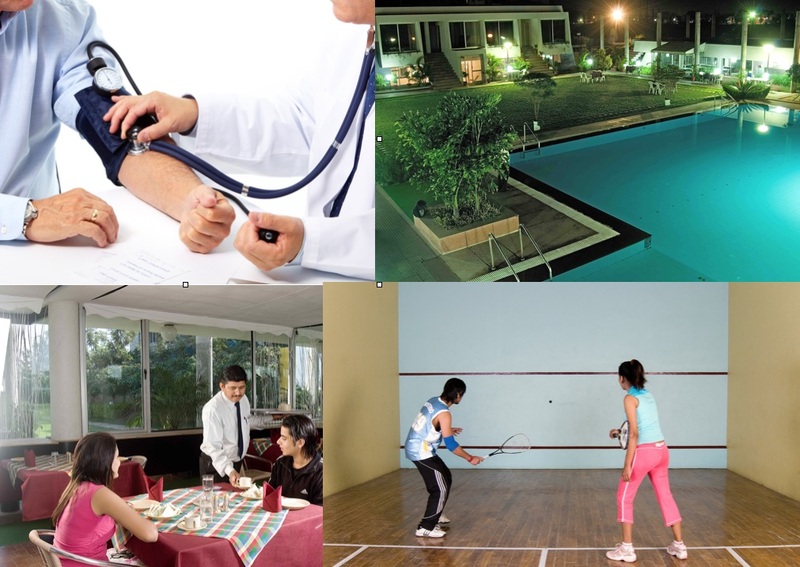 As you are aware, your executive medical checkup shall not be having any "Hospital type" impression, because of lush green, nature friendly surroundings and environment. Therefore, we have some value addition to your star health checkup on nominal charges. This shall include luxurious night stay in a calm and serene environment of our club rooms with gastronomic dinner, sumptuous breakfast, friendly personal approach and attendant during your checkup. We can provide "pick up and drop" services within 5 km of our premises. This shall cost you a meagre Rs. 1 500/- in addition to your chosen Health Checkup Package. If you have individual/customized requirement, we are open to accommodate you so to make your health checkup memorable accordingly. HAEMOGRAM :- Hemoglobin, TLC, DLC, MCV, MCH, MCHC, PCV, Platlet Count, ESR. LIPID PROFILE :- Total Cholesterol. DIABETIC PARAMETERS :- Fasting Blood Sugar, Post Meal Blood Sugar. RENAL PARAMETERS :- Serum Creatinine. DIABETIC PARAMETERS :- Fasting Blood Sugar, Post Meal Blood Sugar, HbA1c. KIDNEY PROFILE :- Serum Creatinie, Urea. LIPID PROFILE :- Total Cholesterol, Triglycerride, HDL, LDL. CARDIAC FUNCTION TEST :- ECG. GENERAL TEST :- X-Ray chest, Urine Routine & Stool Routine. LIVER FUNCTION TEST :- SGPT. KIDNEY PROFILE :- Serum Creatinie. LIPID PROFILE :- Total Cholesterol, Triglycerride, HDL, LDL, VLDL. CARDIAC FUNCTION TEST :- ECG, Echocardiography and TMT. GENERAL TEST :- Urine Routine, X-Ray Chest. LIVER FUNCTION TEST :- Bilirubin, SGPT. KIDNEY PROFILE :- Serum Creatinie, Uric Acid, Serum Calcium. CANCER DETECTION TEST:-PSA(Male), Pap smear (Female). GENERAL TEST:- X-Ray Chest, USG Whole Abdomen, Urine Routine, Stool Routine, Pulmonary Function Test, Serum Calcium, Blood Group, Rh Factor. CONSULTATION:- ENT Specialist, Eye Specialist, Dental, Physician, Gynaecologist & Dietician. KIDNEY PROFILE :- Serum Uric Acid, Serum Creatinie, BUN.